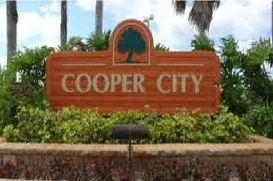 Located in the heart of Broward County, Cooper City is one of the top cities in the South Florida region. Cooper City real estate offers prestigious homes and a prime location near some of the country’s finest museums, parks, beaches, golf courses and entertainment offerings. The city also offers convenient access to nearby destinations and cities like Miami, Pembroke Pines, Davie, Plantation and Weston. Cooper City real estate boasts a diverse array of options such as townhouses, luxury condos, apartments and spacious duplexes. Virtually every type of property can be found in the city for a great price. Cooper City boasts a number of prestigious subdivisions and private neighborhoods that offer majestic homes, quaint settings and ample amenities. One of the best subdivisions in the city is Country Glen, a stately neighborhood known for its Mediterranean architecture and sprawling, luxurious homes. Rock Creek is a quiet community that offers quaint single-family homes and a relaxing, idyllic atmosphere. Another fine community is Embassy Lakes, a subdivision that boasts magnificent homes and easy access to nearby golf courses and cultural attractions. Cooper City is served by the highly-regarded Broward County Public Schools District. Top-notch schools in the district include Embassy Creek Elementary School, Cooper City Elementary School, Griffin Elementary School, Pioneer Middle School and Cooper City High School. The Flamingo Road Christian Academy, a prestigious private school, is also located in Cooper City. Cooper City is home to a thriving small business community and major employers alike. Key companies and employers in the Cooper City area are Bank of America, PNC, DHL Express, the Port of Miami and Florida International University. Top attractions and sites of interest in Broward County and the Cooper City region include the Museum of Discovery and Science, The Hard Rock Hotel and Casino, the Everglades and The Bank Atlantic Center.